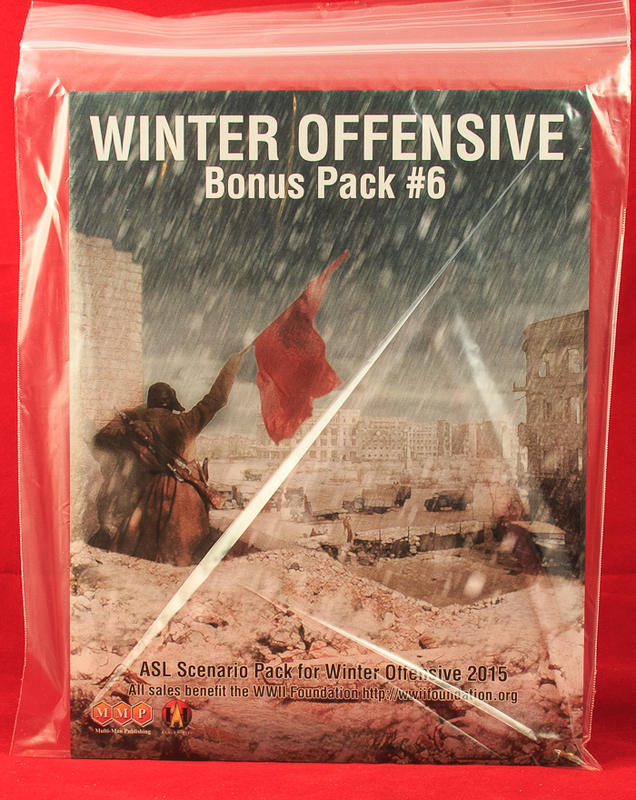 In January 2015, at its umpteenth annual Winter Offensive ASL tournament, MMP released its Winter Offensive Bonus Pack #6, an ASL amuse-bouche to tickle the tummy. The bonus packs typically have 1-2 geoboards and 2-3 scenarios each in them. They are modest little efforts, priced inexpensively, essentially an easy way to claim another ASL product published. The concept of the bonus pack seems rather straightforward, but MMP has done its share of experimenting with them, generally to ill effect, starting with the very first bonus pack, which was an ASLSK bonus pack rather than a true ASL bonus pack. MMP did not repeat that mistake and stuck to ASL packs thereafter. 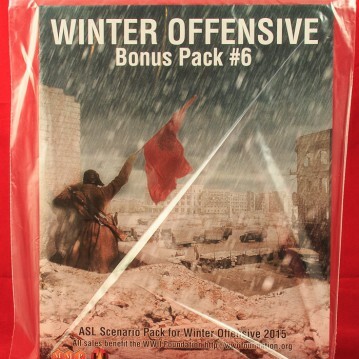 However, Bonus Pack #4 did contain an odd overlay–odd in that 1) it was specifically designed to represent a piece of historical terrain and 2) the unusual nature of the terrain pretty much guaranteed that the overlay would never ever be used for any other scenario (so thus a wasted overlay). After a “normal” bonus pack in 2014, MMP has produced another experimental bonus pack in 2015 and, once more, it was probably not the best of ideas. The conceit behind Bonus Pack #6 (BP6) was to take two classic ASL geoboards, then reprint them with partially changed terrain. The idea evolved out of what was originally an overlay contest of sorts–overlays designed for specific geoboards. That in itself is not a great idea, as it reduces the usefulness of overlays, but then somehow the idea of actually printing these overlays as boards was conceived of. The result, then, is boards 10z and 17z, which are not original geoboards but rather merely variations of existing geoboards 10 and 17. Board 10z is identical to Board 10 from hexrows A through Q and from hexrows Z through GG. Hexrows R-Y (8 hexrows) are different, presenting alternative village terrain to the half of the village on that part of Board 10. Board 17z is identical to Board 17 from hexrows A through J and from hexrows S through GG. Hexrows K-R (8 hexrows) rearrange a few buildings and replace a grain field with a low hill. So, in essence, purchasers of BP6 get a whopping 16 whole hexrows of new board–in other words, when the two areas are combined, they get only one half-board of new art. Otherwise, they are re-buying boards they already own. Does this sound crazy to you? It did to a lot of people when news of BP6 came out. MMP could easily have printed the new portions on an overlay sheet, if they were so enamored of these rather mild changes to the original artwork. Then they could have gone ahead and produced one or two actual new boards that would actually add something new to the system. As small as it is, BP6 is thus one of MMP’s most disappointing ASL products–and if the product were not so inexpensive, might even have garnered a consumer alert warning from Desperation Morale–something that has never happened before for MMP. BP6 does come with 3 scenarios as well as the disappointing alt-geoboards. As with the previous year’s bonus pack, all three scenarios in BP6 are designed by Pete Shelling. WO15 (Liberation Day) is a large 1944 East Front scenario. The attacking Soviets have 21 squads (9 of them partisan) and 4 AFVs, pitted against 17 German squads and 3 AFVs. Each side has different forces entering on different sides, making for multiple simultaneous mini-battles. WO16 (Wildcat Strike) is a rare Central Pacific PTO scenario that features the U.S. Army (the 81st Division) rather than the USMC. A dozen U.S. squads and 3 AFCs must take on 9 Japanese squads, 2 guns, and landmines. The victory conditions are a little complicated, but it is playable. 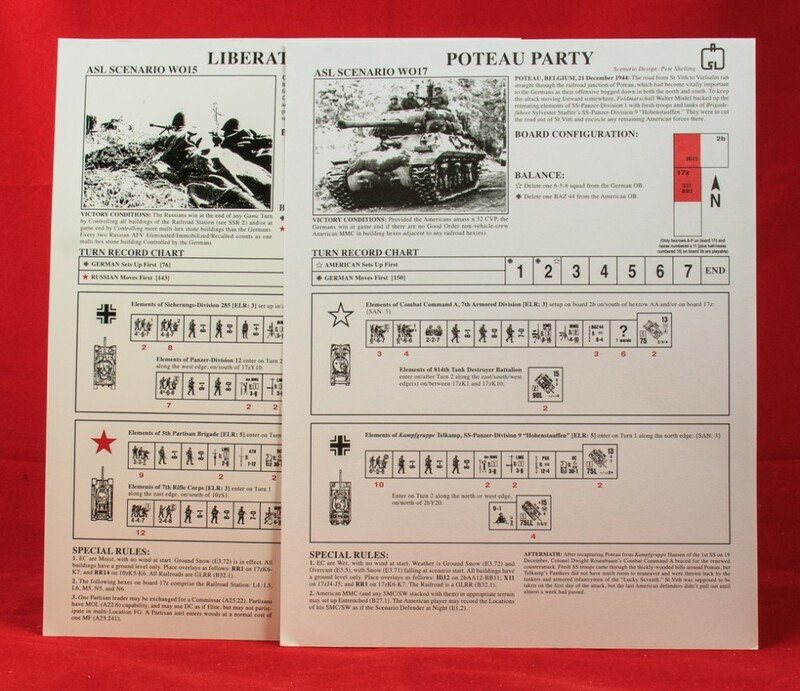 WO17 (Poteau Party) is a Bulge scenario featuring 10 Waffen SS squads and 6 AFVs (4 of them Panthers) attacking 7 U.S. squads, 2 Shermans, and 2 tank destroyers. The Germans have better forces, but have to traipse down a lot of board territory and clear the Americans from a railroad line–without taking too many casualties. The sparse ROAR record to date has no German successes. Well, this seems a little harsh. I always find overlays clunky and this seemed to be a good solution, given that the product is inexpensive. I would prefer new boards, but altered boards insead of overlays have their uses.